Often when I am preparing a show I collect a soundtrack of sorts to give myself and my actors a feeling for the tone and mood of the show. While I was getting The Tragedy of Julius Caesar ready for production in the summer of 2007, I found myself listening to a lot of Radiohead, and one song in particular summed up everything Shakespeare was trying to say about the actions of the characters in Caesar. This was a story about men who thought they were doing the right thing, but instead found their actions leading to chaos and death. If Thom Yorke’s lyrics were obliquely referring to George Bush and his administration’s military actions in Iraq, then they could also refer to Brutus, Cassius, and the rest of the conspirators as they attempt to ‘free” Rome from tyranny. 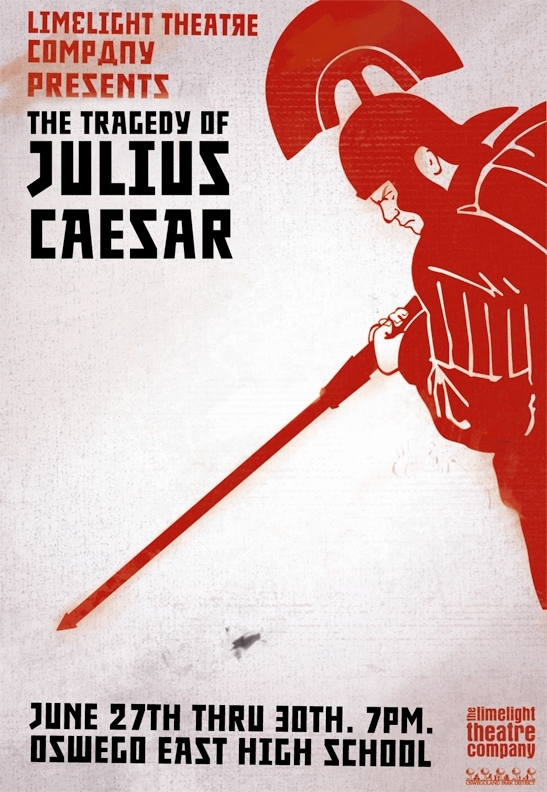 The Tragedy of Julius Caesar is also about Fate, and individuals unable to escape from its grasp. In my reworking of Shakespeare’s original text, I inserted framing scenes involving the actual Fates, who enlist the aid of a man who acts as their Hand, guiding the characters towards their eventual doom. In my version, the Soothsayer becomes a major player, morphing into several characters throughout the play, whispering words into Artimidorus’ ear or acting as Lepidus, the bullied third member of Marc Antony’s triumvirate. His only job is to make sure everything happens as it should. At one point Caesar refers to the Soothsayer as a Dreamer, and in fact the entire play is made to feel dreamlike, with modern dress mashed up with Romanesque togas and classical marble columns existing next to crude metal risers. On alternate nights, male and female roles were reversed, with the conspirators transformed into a gang of vicious high school girls. Are we watching a dream or a nightmare? Fiction or fact? All of this has happened before, and all of it will happen again. A yearly holiday tradition for Limelight has been our production of It’s a Wonderful Life: A Live Radio Play. 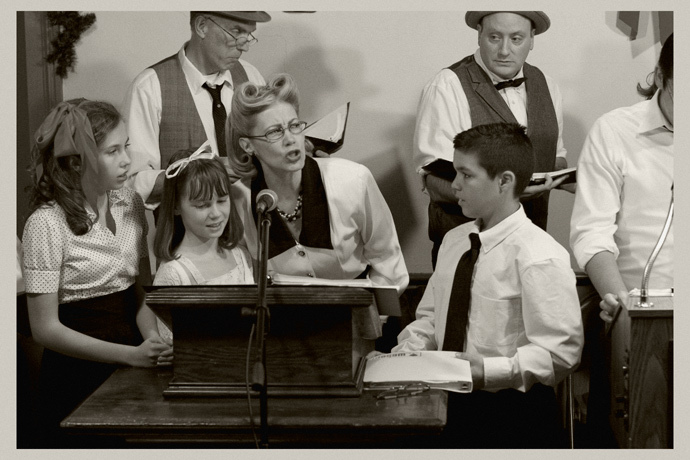 Performed annually since 2006, it takes the very-familiar tale of George Bailey and recasts it as a 1940s radio production, featuring live sound effects and actors portraying a multitude of characters. In addition to directing the first four productions, I have also acted in the show, portraying George’s father, Nick the bartender, and most memorably, the bumbling but tender-hearted Uncle Billy. Initially I had some concerns as to whether a theatrical performance of Frank Capra’s Christmas classic would work, given the immense popularity of the original film. This is a film that millions of people know by heart, after all. I quickly discovered that the radio play setting actually works in the show’s favor, as it becomes less about capturing the “look” of the film and more about the actual story. Despite the lack of sets and other visual clues to indicate what’s happening, the audience is forced to concentrate on the words themselves, allowing the show’s themes (and memorable lines) to shine through. 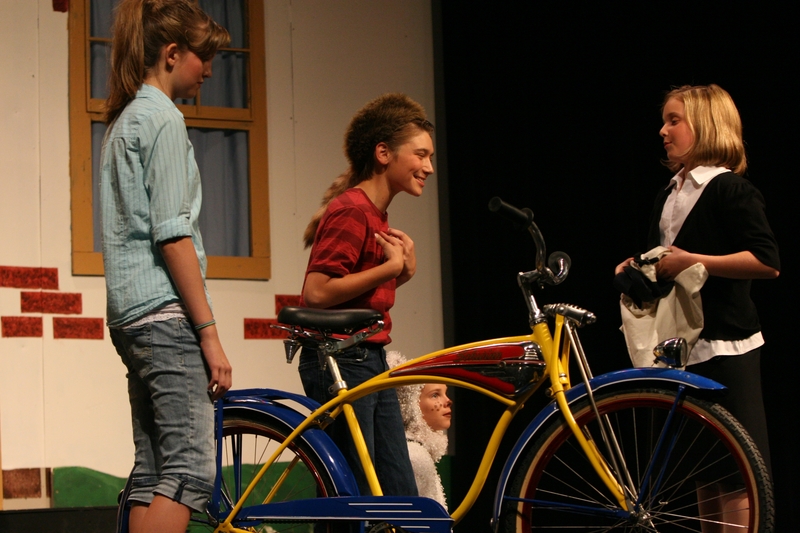 For the last two years we’ve staged our production in a one-room schoolhouse in the small town of Oswego, Illinois. The old wood floors creak as the audience takes their seats, sipping hot chocolate while the actors step up to the microphones, scripts in hand. On some nights we stage “Do It Yourself It’s a Wonderful Life,” inviting audience members to be a part of the show, playing selected characters for a few minutes then returning to their seats. This is the first of our productions to feature a mostly-adult cast, all members of the Oswego community, mostly the mothers and fathers of the younger Limelight ensemble. For a small-town theatre company with a strong family connection, there hasn’t been a better production that showcases the Limelight philosophy. 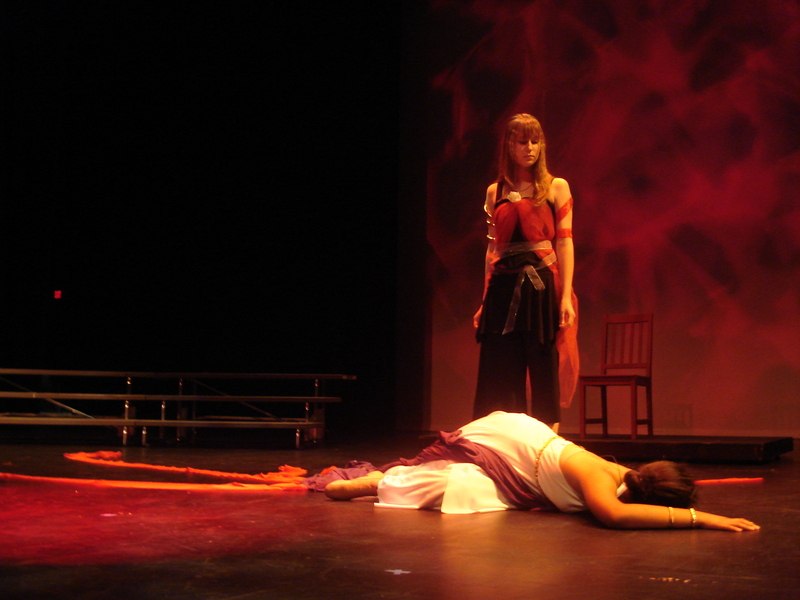 A review of the 2010 production can be found here. After I said goodbye to my original company of actors after Heroes and Villains, I decided to start all over with a new group of young performers in the summer of 2009. 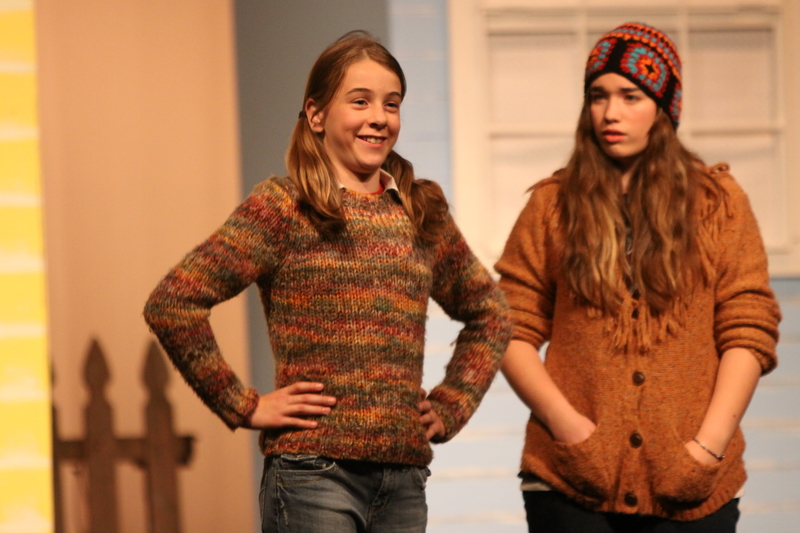 While my old group was preparing our first ever original musical, I directed a pair of shows based on the Henry Huggins and Ramona Quimby characters from the beloved series of children’s books by Beverly Cleary. Henry and Ramona featured young Henry Huggins and his desire to get a job as a paperboy, while simultaneously avoiding the neighborhood pest, Ramona Quimby. The second play, Ramona Quimby, featured Ramona as an older, more tender character struggling with her father’s unemployment, her favorite aunt’s upcoming marriage, and the slow realization that she was just simply different than everyone else around her. Both shows used the same set, but that is where the similarities ended. Henry and Ramona was set in the 1950s, when most of the original Huggins books were published, and it was a bouncy, light-hearted romp featuring coonskin caps, clubhouses, and plenty of Buddy Holly music. The darker, more realistic Ramona books were mostly published in the late 1970s, and that is where I set Ramona Quimby. A frumpy Beezus sneaks peeks at her mother’s copy of The Thorn Birds while Dad sits around the house and smokes Marlboros. Ramona becomes a proto-punk, dancing to The Clash as she escapes into a world of fantasy. I know there was a film version of one of the Ramona stories made recently, starring good-looking people who have good-looking problems and who probably live in a good-looking house. The Ramona books have all been reissued with new illustrations, featuring a cheerful, smiling Ramona on the pages. In my version of Ramona’s world, she’s allowed to be a little messed up, and her family proudly remains working-class, something that has been all but forgotten in these revised and updated adaptations. In the books, Ramona was someone who was quick to anger (and tears) and had no desire to go through life acting like everyone else around her. She was sensitive and smart, brave and a pest. She was a punk before anyone knew what a punk was. She is Ramona, Forever.